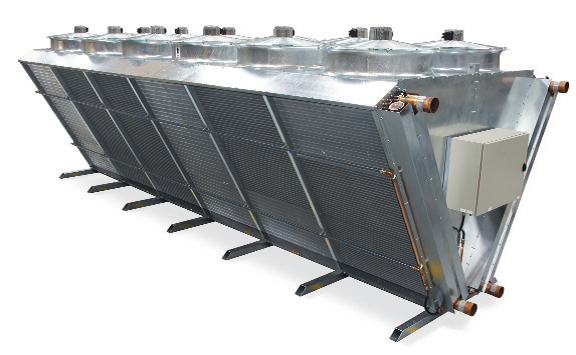 Our range of air cooled, refrigerant condensers has been developed and built to give extremely reliable and robust performance across all models. These units are available for use with R410a, R407c, R134a, R404a and R507a refrigerants. 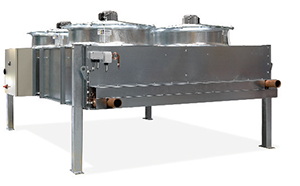 Each model is designed for fast-track installation. Every unit is shipped in a fully operational form ensuring that no special lifting or assembly procedures are necessary, vastly reducing on-site time, cost and expertise. A choice of control options is available including fully fitted and pre-wired panels with stage control or an energy saving inverter drive. Single or multiple pressure transducer controls are available for head pressure control on single or split circuit condensers. All controls are pre-commissioned at our UK manufacturing facility offering a ‘plug and play’ solution therefore providing installers valuable reduced setup times. A flexible range of fans and cooler unit configurations ensure that projects with environmental, noise and/or space restrictions are catered for. 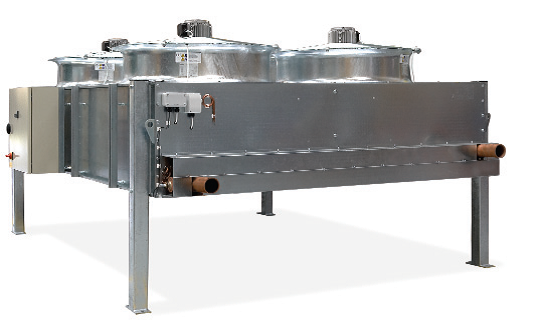 Adiabatic condensers are available on the air cooled condenser range, providing lower condensing temperatures and offering improved system efficiencies with lower running costs.